Generalized optical angular momentum sorter and its application to high-dimensional quantum cryptography, Optics Express 25, 19832 (2017). In the last decade, photonic spin-to-orbit coupling via the use of an inhomogeneous and anisotropic layer of nematic liquid crystals has been shown to be a compact and efficient method for beam shaping due to its simultaneous influence on a beam’s phase and polarization profiles. Due to their enhanced performance, devices relying on optical pin-to-orbit coupling, such as q-plate, have found extensive applications in fields such as quantum information and microscopy. 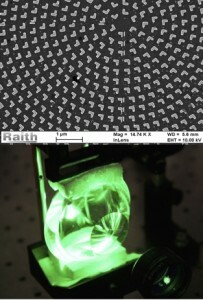 Our research team aims to take full advantage of this technique to design novel liquid crystal-based devices with the ability to generate a variety of optical beams, create custom singular optical structures, and act as intensity masks. We have demonstrated our ability to arbitrarily modify optical wavefront by generating a wide variety of beams such as vortex, high OAM, Ince-Gauss, Bessel, and Airy beams which have potential applications in quantum communications, super dense coding, and optical trapping. Optical orbital angular momentum (OAM) associated with light beams possessing a helical phase-front finds various applications in numerous research areas such as imaging systems, optical tweezers, quantum information and quantum communication. Our research team is interested in design and fabrication of novel optical devices suitable for manipulation of optical OAM in the classical and quantum regime. We have invented, designed and characterized an achromatic orbital angular momentum generator that may find applications in imaging techniques from micro- to astronomical systems. We also invented one of the most ultra-thin spin-to-orbit angular momentum converter working under the principle of plasmonic resonances suitable for applications in quantum communications, quantum computations, and nanoscale sensing. Optical spin-to-orbital angular momentum conversion in ultra-thin metasurfaces with arbitrary topological charges, Applied Physics Letters, 105, 101905 (2014). [PDF]. The quantum mechanical principle of wave-particle duality is not limited to light and its constituent photons. 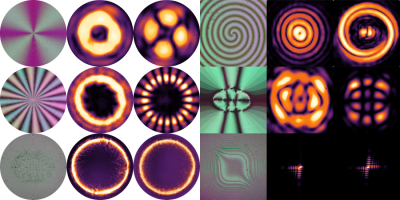 Indeed, matter can also be made to exhibit wavelike behaviour, as dramatically demonstrated by numerous experiments in diffractive electron optics. Remarkably, the wavelike properties of matter suggest that the very same techniques used to structure beams of light can be applied to shaping matter waves. The SQO group is particularly interested in investigating the unique properties of structured electron waves. Apart from showing tremendous potential for a host of applications in electron microscopy and nano-fabrication, structured electron waves can allow us to observe otherwise inaccessible physical effects, putting a range of exciting and fundamental phenomena within our reach, to be studied as never before.